Summertime means lots of salads in the Joyously Domestic household. We eat salad quite regularly as our full meal when temps get up in the eighties and nineties this time of year. Some of our favorites are my Berry "Peachy Keen" Grilled Chicken Salad Bowl, my Easy Vegetarian Taco Salad, my Moroccan Quinoa and Bulgur Salad and my Mexicali Loaded Salad Bowl with Creamy Avocado Lime Dressing . I always buy a plethora of fresh produce each week and like to keep the ingredients for many of my go-to salads on hand. So, it's a breeze to whip up quick, light meals for us on busy weeknights ... or when we're being lazy on the weekends and don't want to put much effort into dinner. 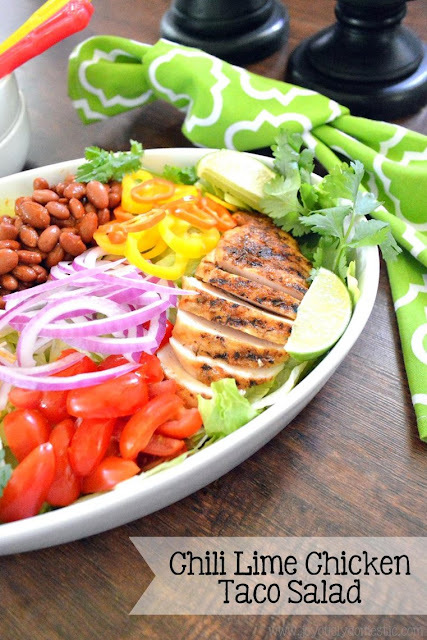 This particular salad includes some killer grilled chicken that has real amped up flavor. I like that a couple of chicken breasts stretch to feed several people, so it's a pretty inexpensive salad to toss together. For this salad, I like old-school iceberg lettuce for the base. I, then, arrange the taco salad toppings that my family prefers on top. We serve this with fresh-cut avocado, lots of sour cream and hot sauce alongside. And, don't forget the nacho, corn or tortilla chips ... they are the cat's meow, so-to-speak, crushed atop the salad at time of service. Simple. Flavorful. Inexpensive. A perfectly refreshing, healthful and bountiful salad for those nights when you don't want anything too heavy for dinner, yet something delicious and satisfying is in order. Combine cumin, chili powder, oregano, salt, pepper, lime zest and lime juice in a gallon zip-top bag. (Ingredients will, basically, make a loose paste.) Place chicken into bag, seal and massage breasts to coat with paste. Allow to "marinate" on counter for 15 - 30 minutes. Meanwhile, place lettuce onto large platter or in the bottom of a large serving bowl. 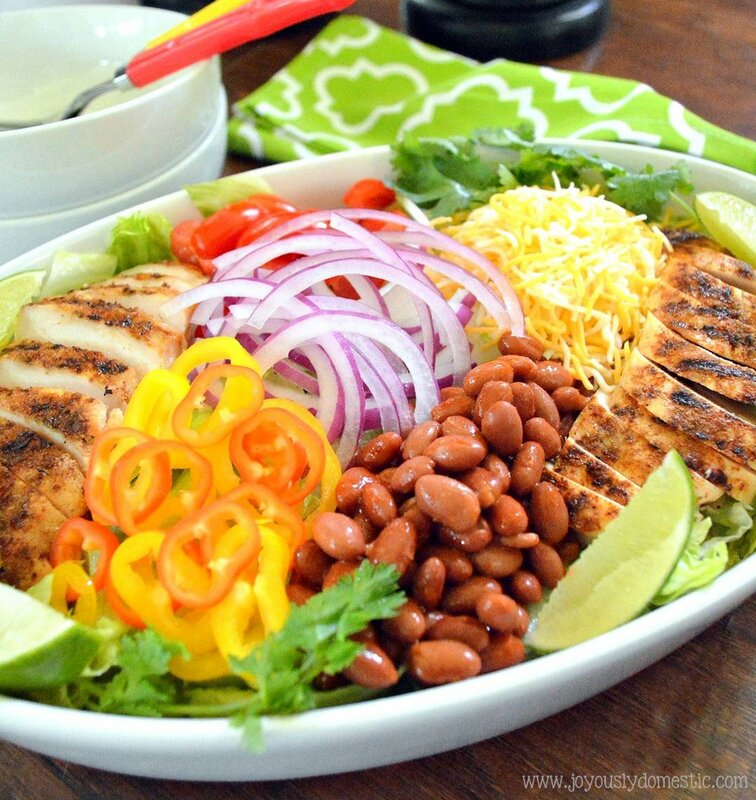 Arrange cheese, beans, peppers and onions on top of lettuce - leaving room for chicken once cooked. Remove chicken from grill. Slice or chop into desired size pieces. Arrange atop salad. Garnish with cilantro and lime slices. Serve immediately with desired additional toppings or garnishments. This looks so yummy. I love your salad recipe ideas and have tried a few. Looking forward to this one. Thx.